After Three Colours: Red I watched a preview of The Three Burials of Melquiades Estrada. It was a three themed evening. This had the same writer as 21 grams, and you could tell, because he was messing around with the linear time thing again. The last half of a movie was pretty much in a straight line though. 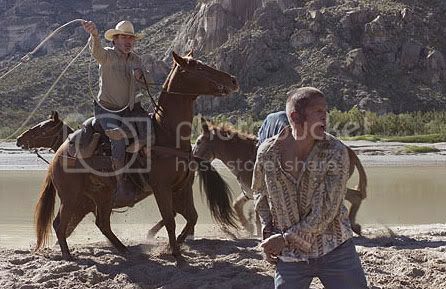 Tommy Lee Jones was excellent, and Texas and Mexico were shot beautifully. I was really impressed by it.